The complete results to include the list of topnotchers or top 10 passers for March 2017 Physician board exam are available on this page as released on Thursday, March 16. Karl Emmanuel Cueva Mercader from University of Perpetual Help System Dalta (UPHSD) - Las Pinas led the passers with 88.58%. It was followed by Alvin Lester Samson Villas of Our Lady of Fatima University (OLFU) - Valenzuela with 87.17%. 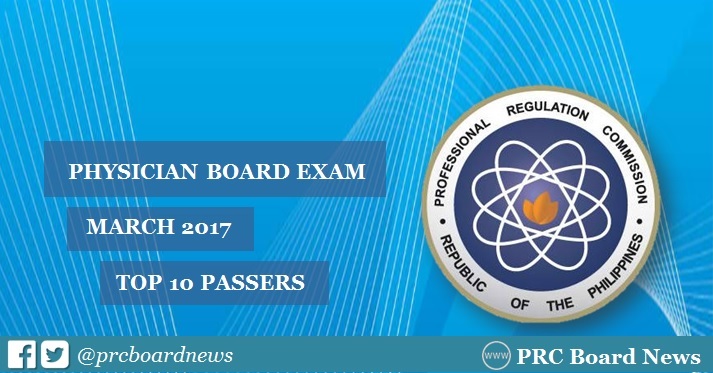 The Professional Regulation Commission (PRC) and the Board of Medicine conducted the first Physician board exam this year on March 5,6, 12 and 13 in the cities of Manila, Baguio, Cebu and Zamboanga.